The Global Positioning System or GPS is a device that has many uses for the small business. A GPS system is vital if your business includes any kind of transportation or delivery service, or if you have salespeople or workers in the field. With ever rising fuel costs the Global Positioning System also makes sense as a cost effective business tool. GPS is a navigation system that relies on a network of satellites that orbit the globe. GPS was originally used for the military but its applications are now available to both business and personal users. The Global Positioning System can be fixed into any type of motorised vehicle to allow users to find their destinations easily. 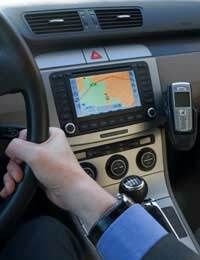 Technological developments mean that the handheld GPS is now available through devices such as the mobile phone and personal digital assistant (PDA). Easy navigation to and from destinations using the shortest route. Keeping track of vehicle fleets on the road. Plotting the shortest routes will save on fuel consumption. Ability to inform customers exactly how long a delivery will take. Time saving by using the shortest and most efficient routes. Ability to track any vehicles that are stolen. Extremely accurate and available 24 hours per day. The most popular Global Positioning Systems at the moment are those that can be fitted into vehicles such as trucks, taxis and delivery vans. GPS navigation has become pretty standard within most of the transport sector, and you will be hard pushed to find a taxi without one. Handheld GPS devices are also becoming extremely popular as more mobile phone networks begin to include them in their handsets as standard. GPS devices are not expensive compared to when they first arrived on the market a few years ago. As with all technology the price does reduce as new developments are made. The actual satellite navigation technology is free to use, customers need only pay for the equipment. The price of the GPS hardware and GPS software will depend on the level of sophistication. For instance GPS can have audio in a number of languages, 3D graphics and of course multiple maps. More recent software has allowed GPS to actually say the name of the streets and roads rather than just give voice commands to turn left and right. Time efficiency and fuel saving are two of the big selling features of GPS for the small business. Businesses are able to track deliveries, know exactly how long it should take for a delivery to be made, and plot the shortest routes. Fuel prices are set to continue to rise and businesses can drastically cut their fuel consumption by plotting the shortest and most efficient route. This not only saves on fuel but also cuts down on expenses such as staff overtime for extra deliveries. Sales people in particular have learned the benefits of the Global Positioning System. Salespeople who are continually out on the road can now find destinations much easier than the traditional map reading scenario. With handheld GPS on mobile phones and PDAs, there is never an excuse for being late for that important business meeting. GPS can also be synchronised with laptops so that workers in the field can plot their course the night before they leave the office or home. GPS technology is an excellent tool when it comes to time and cost saving solutions for the small business. Any employee that spends a great deal of time on the road will already know the benefits of this piece of technology. GPS is essential for the small business to stay in competition with the corporate giants, and its value cannot be underestimated.